The day after the United States Sailboat Show in Annapolis, Maryland, Catalina Yachts' Gerry Douglas was in his element, hoisting and trimming sails aboard the company's brand-new 275 Sport, a club racer and daysailer-weekender that is a faster, redesigned Catalina 27. The 275 Sport made its debut at the Annapolis show and caught some people by surprise, with its plumb bow, generous freeboard, open transom and powder blue topsides. It is, indeed, a fresh tack for Catalina Yachts. "The idea for the 275 Sport was built from lots of observations and conversations with friends who have huge boats they don't use enough," Douglas said, as he set the main and self-tacking jib in a light northeasterly. We slipped across the mouth of the Severn River toward Chesapeake Bay. "The 275 Sport is a boat that doesn't require a large racing crew or expensive gear and intensive maintenance. It was designed to keep sailing simple and fun," he said. Douglas, who is a company vice president and has designed yachts for Catalina since 1983, said the 275 Sport is expected to be attractive to both new and experienced sailors. "We know there are boat owners out there who are downsizing," Douglas said. "For years they have been organizing crews for races or cruises, and now they want something they can jump aboard, sail for a few hours or a weekend and then hose it down and put it away until the next time." In short, the people at Catalina Yachts are going with an apparent trend among boaters who want to keep it simple, whether they are experienced sailors or novices. Douglas says Chesapeake Bay dealers for Catalina Yachts have expressed interest in the 275 Sport, and much of that interest has been focused on the possibility of selling fleets of the sport boat to local or regional sailing clubs. With a waterline of 26 feet 7 inches, an 8-foot 4-inch beam, fin keel and spade rudder, the 275 Sport should be fast and easily driven. On our test sail in 6- to 8-knot breezes, the 275 Sport made close to 4 knots on an easy beat. "Any time I can make half of wind speed going to windward, I am pretty happy," said Douglas, adding that the long waterline, full bow sections and wide, flat aft sections should create minimal drag. "The boat should perform well on all points of sail." Later, as we turned back toward Annapolis and set the asymmetrical spinnaker, the blue-hulled 275 steadily topped 6 knots with the wind just aft of the beam. Even in the light air, the power of the rig was evident. Given 10- to 15-knots of wind, this rascal should fly. The hull is hand-laid fiberglass and the deck is one piece with molded nonskid. The overall fit and finish on hull No. 1 was excellent. There is a five-year structural warranty on the hull and a five-year protection program against blistering. The standard boat with fin keel draws 4 feet 8 inches. An optional wing keel is available, and its 3-foot 8-inch draft may appeal to sailors in shallow areas such as Chesapeake Bay, the New Jersey back bays or the North Carolina sounds. Both keels are lead with stainless keelbolts. The fin keel weighs 2,040 pounds, while the wing keel weighs 2,200 pounds. The 275 Sport weighs 5,000 pounds, and with an 8-foot 4-inch beam, the boat is trailerable. Both the standard and racing models come with tiller steering. The sailplan has a high-roach mainsail with slab reefing and full battens, while the 100% jib is self-tacking on a traveler installed just forward of the mast. On downwind legs, the 275 can fly an asymmetrical cruising chute tacked to a retractable bowsprit. All lines are led to the cockpit, with the ball-bearing mainsheet system on a traveler that separates the fore and aft sections of the cockpit. According to Catalina, the best setups for downwind sailing are either a code zero with fixed luff and roller furling, or an asymmetrical with a top-down furler and a loose luff. Douglas' hull No. 1 had the top-down furler set up and the optional retractable bowsprit. The designed sail area with 100% foretriangle is 318 square feet. The mast and boom are anodized aluminum. There is a PVC wiring conduit and messenger line in the mast and an internal outhaul in the boom. Running rigging is low-stretch Dacron. The 275 is powered by a 2-cylinder, 14-horsepower Yanmar diesel with sail drive. The diesel moved the 275 easily and quietly. The 12-volt electrical system comes standard with a single series 27 battery, although Douglas said there is room for a second battery. The 275 has LED lighting throughout, as well as an anchor light at the masthead, steaming light and international rules compliant running lights. Douglas has created an innovative, multipurpose boat that allows for speed, comfort and safety, from an impact absorbing crumple zone in the bow to the possible addition of a safety net across the walk-through transom. But it is the expansive cockpit that will be the center of onboard activity, and Douglas has nicely blended form and function on the 275 Sport. "This is where you will be when you are sailing," Douglas said. "You have to be comfortable and be able to move about easily, even with four or five aboard." There are two cockpit lockers, including a large sail locker to port and large storage area to starboard. A retractable boarding ladder stores under the aft end of the self-bailing cockpit, and there is a through-deck handle for the manual bilge pump. Overall, the deck and cockpit are well laid out and functional, from the stainless steel pulpit and molded anchor locker, to the backstay purchase, which is led forward under the cockpit to a traveler beneath the cockpit sole. Overnighting aboard the 275 Sport would be difficult for a tall person, as the cabin headroom is limited. Still, Douglas has worked an enclosed head, compact galley and three long, comfortable berths into the interior, along with more innovative touches. The V-berth forward converts to a dinette by raising the insert. The quarterberth to starboard is lengthy, long enough, Douglas said, to store a kayak or stand up paddleboard inside. There are storage lockers under the berths, and four removable gear bags for soft goods such as clothing are mounted as backrests. An overhead hatch and the companionway provide ventilation, and the interior trim is solid maple, and the cockpit sole is a teak-and-holly laminate. There is overhead LED lighting and fiberglass hull liner. The galley includes a drawer for a large icechest and space for an optional stove. The sink has a hand pump that draws from a small freshwater tank. The enclosed head includes toilet, sink, opening port and a hanging locker that would be especially good for wet weather gear. A portable head is standard on the 275, but an area has been molded for the optional marine head. While the accommodations are well planned and executed, overnighting or weekending would be best for a small family or two very close friends. Hull No. 1's light blue topsides are an eye-catching option, but white is the standard dress for the 275. For those planning to drysail or trailer this boat, a single point lifting gear is available for use with hoist or crane. An asymmetrical spinnaker with dousing sock or code zero type spinnaker with furling system, and a retractable bow sprit are options. 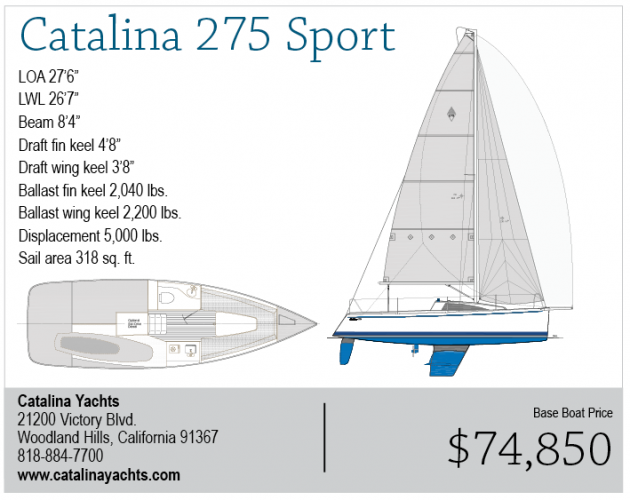 It seems Douglas and Catalina have exceeded their goals in designing and building the 275 Sport. It is not a bulky, go-slow cruiser, nor is it a high-tech racer. The 275 Sport is a boat that will do very well as a club racer or daysailer-and do so simply and economically. Even in light air its power is felt as the boat heels slightly, the rudder bites in and the tremors rise along the tiller. Sail it hard. Hose it down. Put it away until next time. Simply, this boat is fun.